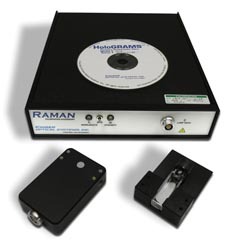 RAMANRXN SYSTEMS™ suite of Raman analyzers, makes wavelength and intensity calibration for Raman instruments fast, simple, and accurate. The HCA calibrates Raman instrumentation in the visible and NIR regions yielding accurate Raman spectra in terms of both wavelength (x-axis) and intensity (y-axis). The easy-to-use 3-step calibration protocol provides the accuracy and repeatability critical for qualitative and quantitative Raman analysis. Used routinely, the HCA protocol facilitates calibration transfer between laboratory instruments and on-line process analyzers. The HCA contains both wavelength and intensity sources in a compact lamp housing. Neon emission lines provide accurate x-axis calibration. A NIST traceable white-light source provides a relative y-axis calibration. A standard Raman sample is used to provide precise laser wavelength calibration and in addition is used for system qualification.